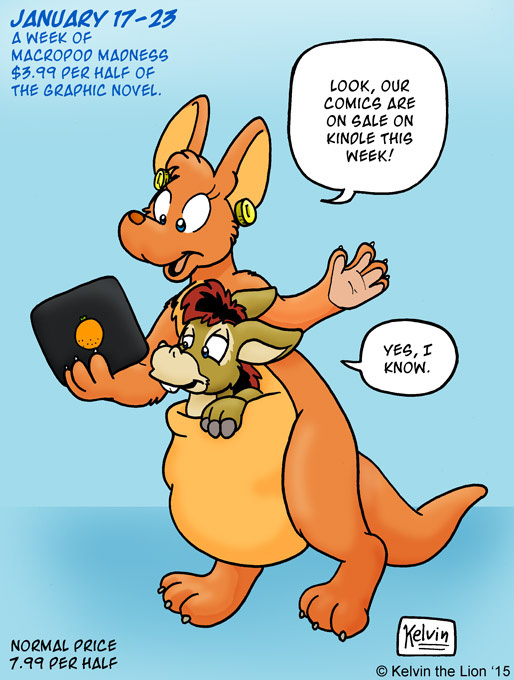 Half price Macropod Madness comics this week only! Check it out at the links below. Part 1: http://www.amazon.com/gp/product/B00MJUHQNS/ref=s9_sim... This is the first half of the book which introduces the land of Cirvinia and the quirky characters within. Just as with the original web comic we follow our characters' exploits near the end of summer vacation. Part 2: http://www.amazon.com/Macropod-Madness-Book-Part-Pouch... Things heat up and the stakes are raised. Can Jenna endure the wrath of a jealous voodoo witch and her carnivorous bunny? Note: if you live outside the USA, check your own Amazon Kindle store for similar sale listings.